Announcing Our 2018 Summer Reading Program! #LVReads is a summer reading program for all students from preschool through high school. The program’s main goal is to create confident and capable readers who find JOY in reading. #LVReads has no reports. No tests. No vocabulary lists. Just read! 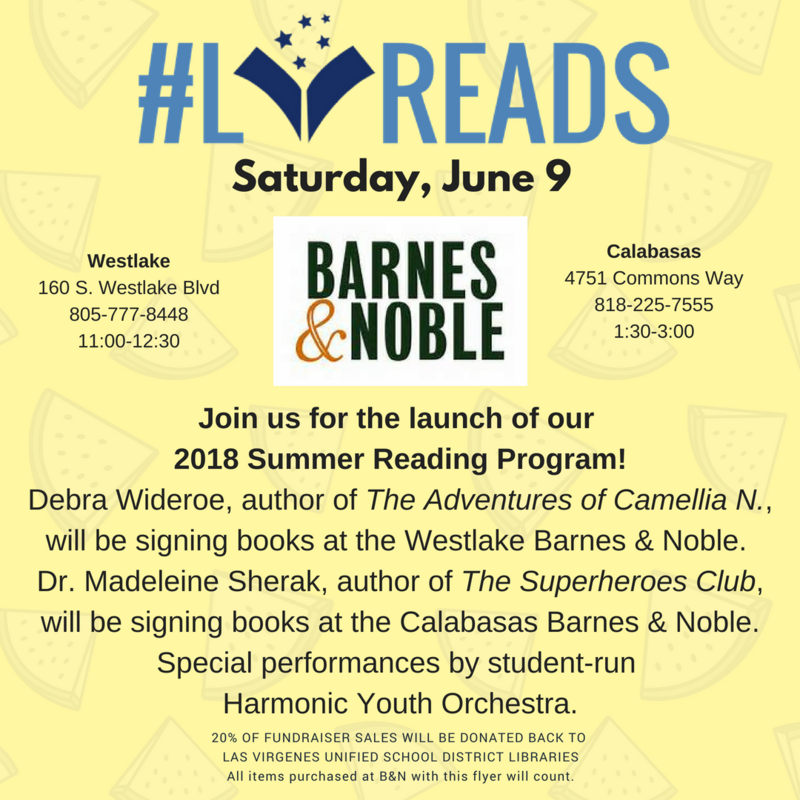 Bring this flyer to Barnes & Noble in Westlake or Calabasas through Thursday, June 14 or mention LVUSD or LVReads and a percentage of your purchase will be donated to LVUSD libraries. #LVReads promotes autonomy, independence, mindfulness, thoughtfulness, and empathy in alignment with our Student 360 initiative. Our wonderful companion program, Parent 360, will continue through the summer LIVE on Facebook on Mondays beginning June 25. And summer fun continues almost daily at our local libraries and Barnes and Noble. Get all the dates on our summer of fun calendar! When you're picking out books or reading, capture the moments and share them with us on social media! Join our summer social media challenge! 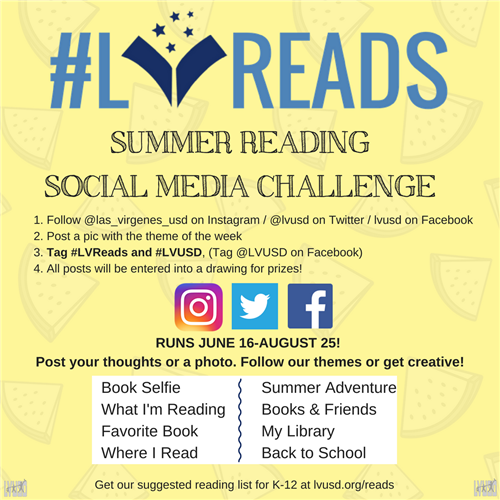 Use #LVReads to tag your shares. You can participate in the photo theme of the week if you want to, or be creative! Family members, staff, and secondary students (age 13 and older) are all welcome to participate! Follow LVUSD on Twitter, Facebook, and Instagram! Created by a reading specialist and our district librarian, our lists of suggested book titles will keep your students engaged with reading over the summer. These are organized by age and reading level. If you're planning to buy these books online, please use THE Foundation's Amazon Smile account so a percentage of sales can be shared with our LVUSD Library Media Centers. Otherwise, visit our special displays at Barnes and Noble in Thousand Oaks or Calabasas to pick up some fun titles for the summer. Join us on June 9 for the great LV Reads kickoff! We'll have staff there to help you pick out books, entertainment, and special guests.